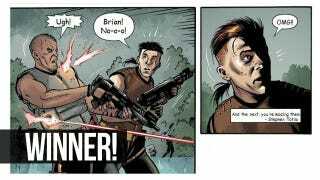 In case you missed it, Dark Horse gave Kotaku readers the chance to write their own captions for a page from the first issue of the Star Wars: Knights of the Old Republic: War mini-series. Tons of entries rolled in but we were only able to pick ten winners for digital versions of the first issue. Kotaku user TaggarT6's its mournful yet funny take on how the change of editorial leadership REALLY happened grabbed the top spot with ease. Other standouts drew directly from infamous Star Wars cinematic moments—like those from Sparkles AstroChimp and capt_weasle—while the text from gametr4x went into meta territory. The rest of the top ten were simply sillier or funnier than the rest. Winning users can private message me to get redemption codes and I'll reply to their Kotaku user accounts. To redeem your prize, winners need to sign up for a free Dark Horse digital account (if they don't already have one) on digital.darkhorse.com. You can then place KotOR: War #1 in your shopping cart and enter the code at checkout. Thanks everyone for participating!